Vernon Masayesva is a member of the Coyote Clan of the Hopi tribe in Northern Arizona. He is from the Village of Hotevilla on Third Mesa, one of the fingers of Black Mesa. Mr. Masayesva, who is fluent in Hopi and English, received a B.A. at Arizona State University in Political Science and a Masters of Art from Central Michigan University, before returning to Black Mesa and serving as Principal of the Hotevilla-Bacavi Day School, the first Indian-controlled school on Hopi. In 1984, he was elected to the Tribal Council and then served as Tribal Chairman from 1989 to 1993. From 1995 to early 2001, he was Director of the Arizona Native Scholastic and Enrichment Resources Program, a joint effort with the University of Arizona’s American Indian Studies Program and several private schools in the state to provide talented Native American students with educations at independent college-preparatory schools to prepare them for leadership roles in their communities, tribes, and nation. Mr. Masayesva has been involved in the tangled intricacies of coal and water mining on Black Mesa for decades. 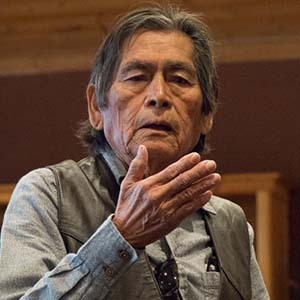 Today, he is Director of Black Mesa Trust, founded in 1999 by the Hopi people to address the severe environmental impact and destruction that Peabody Coal Company’s water withdrawals (from the Navajo Aquifer) were having on the environment and the cultures of the Hopi and Diné (Navajo) people living on Black Mesa.